The launch party will be held at Bark Avenue, on December 7 from 12:00 p.m. to 4:00 p.m. The public is invited to come out and celebrate the launch and support Canine Companions for Independence, too. Bark Avenue will also offer to launch party participants $5 OFF any purchase of $30 or greater. that is, Princess Josie, the delightful doggy who believes she is a princess. Explore her royal world as seen through Josie’s puppy eyes. This beautifully illustrated children’s picture book takes young readers into the creative imagination of Josie, the beloved doggy who adores her family. 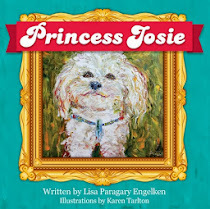 Enjoy reading this unique and funny bedtime story to your children as Josie leads readers through her fanciful, imaginary world where she is the princess and her family the royal family. If you have young children, grandchildren, nieces or nephews or want to gift a friend’s children, this divine, richly illustrated children’s book guarantees to entertain. It features many beautifully hand-painted illustrations by Karen Tarlton that art lovers will also enjoy.